Happy Christmas everyone! I finished the Christmas cardigan for my mum the day before yesterday (Christmas Eve Eve) and I think she’s happy with it. As you can tell from above, the steeking went pretty well. Firstly, I crocheted either side of where I wanted to cut. Then I got my scissors out and carefully cut one line of stitches down the front. Nothing unravelled and it all behaved nicely. It was only when I had one half of my button band made that I realised that I was going to be stuck with a whole pile of wriggly bits underneath each band (you can see them in the picture). Since this cardigan is designed to hang open, these are going to show from time to time. I think I will probably sew some ribbon facing over them to cover them up and make it all secure. I know it all sounds worrisome but overall, I think it was worth it because working the body flat would have taken me a lot longer than it did. I chained around the entire outer edge with single crochet to tidy it all up. As you can see, one of my button bands is pulling up a little but I plan to block the bejaysus out of it so it should behave in the end. It fits, she loves it, success! I will post pictures of Mum wearing it soon. Remember those black socks I was working on? Well, something went horribly, horribly wrong last Thursday so I won’t be talking about them for a while. Have a look at my wimple instead. 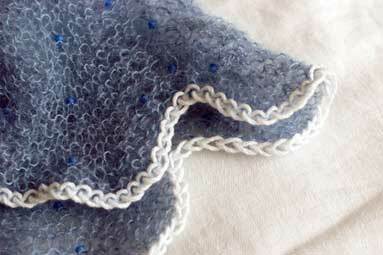 The pattern is Ice Queen from Knitty. I’m using Kidsilk Haze and some beads I got in Yellow Brick Road on the Quays. 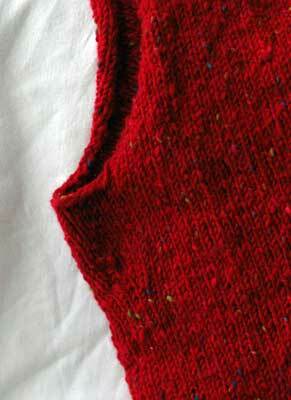 I am about three-quarters finished and I’m surprised that it has turned out to be a very straight forward knit. I have only lost a few beads, which is really saying something. Those things can really bounce. Since this season, I am one of those annoying people who did their all Christmas shopping two weeks ago and who is even on the home stretch of Christmas knitting (both sleeves complete! (there are not enough ! marks to express my relief/joy)) … I got to go into Galway to potter about and enjoy the atmosphere. Honestly, I didn’t think it would be possible but I had a very enjoyable afternoon taking photos with possibly the greatest camera ever made (my dad’s Bronica – heavy, totally manual, big film that has only 15 shots, a handheld metre crucial – heaven). I had a hot chocolate and bought some fabulous Irish cheeses. I took some of my favourite shop fronts – Couch Potatoes, the mural on Sally Long’s, the bakery on Shop St, Tigh Cholí – as well as some ‘boring’ shots of derelict buildings and their surrounding areas that are either about to be turned into apartments or are already on their way. Sometimes I stop myself from taking photos of our ever-changing landscapes because I think they are boring, but then remind myself of Fr Brown’s fascinating photos of Dublin. I particularly love his photo of O’Connell street taken at a time when the Gresham hotel wasn’t even built: there was just a big gap in the middle of the street. I won’t print them up until I get back to Dublin but stay tuned for knitting progress tomorrow! Another hot chocolate anyone? How many times is too many? Why is it that after almost a week, I have only a sleeve to show? Normally I would blame the sleeve and everyone would understand. This time, however, I have only myself to blame. This is a set-in sleeve and I knew I would have to work a sleeve cap. This didn’t stop me from very, very carefully picking up the stitches and very, very carefully working a straight, drop-shoulder sleeve. I was so careful that I got as far as the elbow before I realised (in my defence, I was still sick and it was only in the grim cold light of the next morning that I noticed my error). 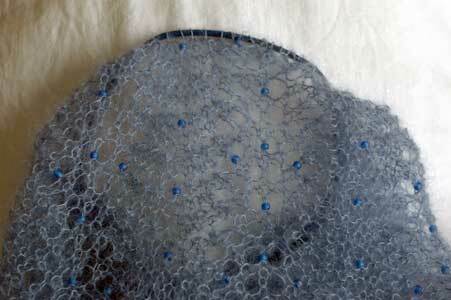 I ripped it out and picked up my stitches again to work the short rows for the sleeve cap. 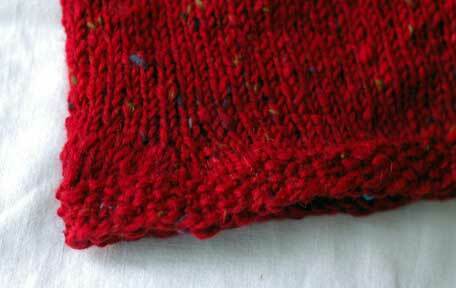 It seems that every time I work short rows, I am doomed to work a short row heel… no matter what I am knitting. I ripped it out. Drew a little diagram of what I wanted to do. Picked up my stitches and got going. 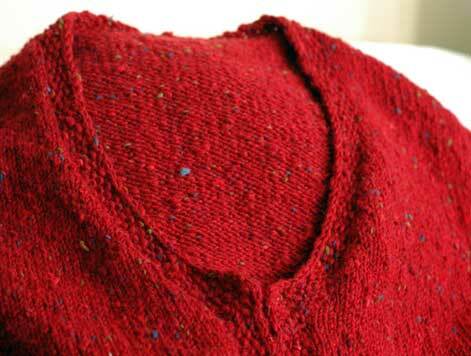 Halfway through the short rows, I panicked about my rate of short-rowing and adjusted it. Continued down the sleeve, only to panic again about my rate of decreasing and adjusted that too. Bound off the cuff and got Mum to try it on. It would have been perfect if I wanted a cardigan with puffed sleeves. Any other time of the year I would have been glad to find this out. Any other time of year I would have been sensible and stuck to my guns (in my defence… I have no defence for this one). I ripped it out very, very quickly before I could think about cutting it open and adding a little strip maybe and taking in the gusset (see? I already had an insane plan gathering steam. This is why it is better to close your eyes, stifle the scream and rip as quickly as you can). Yesterday afternoon, I sat down, picked up the stitches, worked a normal sleeve cap, worked normal decreases, round and round and round and by the time the news was on, it was finished. 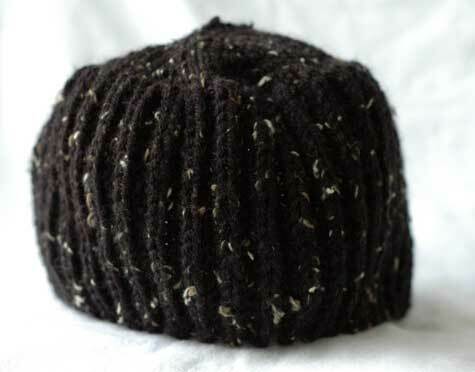 Behold the wonderous sleeve cap. It is, after all, the season for miracles… even slow and tortuous ones. Now I just have to do the other one. The New Year is a perfect time to teach yourself some new skills and broaden your horizons. 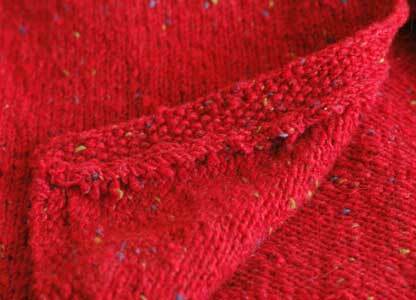 Check out the new class schedule over at This is Knit for a wide variety of classes. There is something for everybody, from beginners ready to move beyond the humble rectangle to seasoned knitters looking for a bit more bite to their knitting! 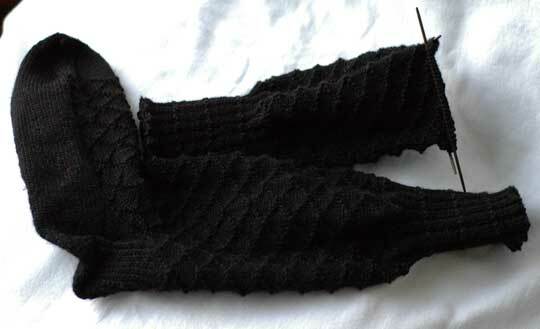 I will be giving classes on top down knitting (two separate classes for raglans and set-in sleeves… super quick and easy when you know how! 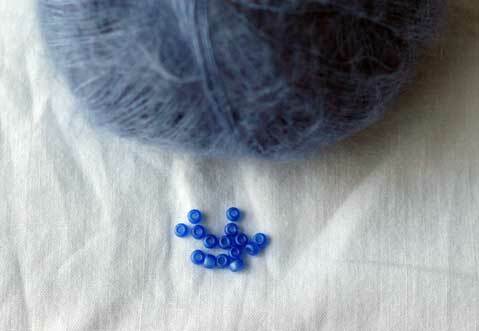 ), an introduction to colourwork and a class on adding beads and decorative borders to your knitting. I am really excited about these classes! They are always lots of fun. A word of warning, though: class numbers are limited so that you get the most bang for your buck and classes often sell out weeks in advance. Don’t leave it until the last minute! Hopefully I’ll see some of you there. It’s been a mixed bag already this week. 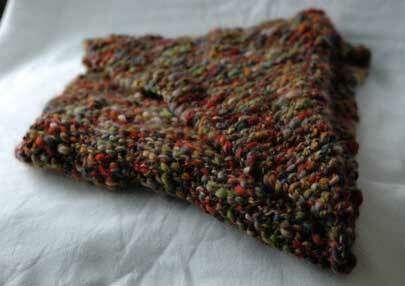 I’ve been taking part in a swap on the Irish Knitters board over on Ravelry. We each get a secret pal to spoil, and in turn are spoiled by another secret pal. I have been busy loading up on stuff to send off to my pal so wasn’t really expecting to 1. get my spoils so soon and 2. to be spoiled by someone I know! My secret santy was Heidi and she gave me my parcel at the Glasnevin group on Monday. Look what was in it! 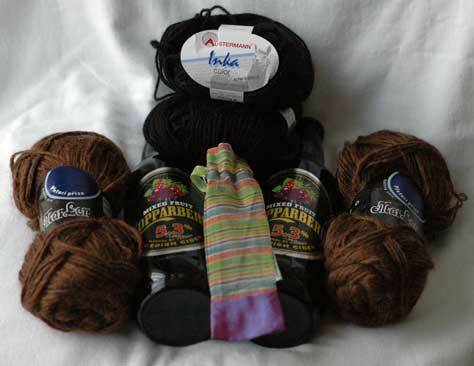 The yarn is from Prague – the brown is a gorgeous wool and the black is the softest alpaca ever. The little parcel in the middle is a replacement set of Lantern Moon needles (if you remember this you’ll understand!) – I was actually really touched by this. Such a kind thought. The bottles? Two Kopparberg! (I am a regular drinker of Kopparberg at the group) Missing from the photo is a bag of wine gums. I wonder why… Good job, Heidi! Isn’t she the best secret santy? The downside to such an upside is that I came over feeling very unwell yesterday. A while ago, I made a Moebius as a thank you present for Aoife O’Leary who did such a great job creating a dress for my concerto final in the NCH two years ago. I’d always meant to make her up something as a thank you – I got some other things made up while I was at it and I have worn them to death, but they still look great – but kept letting things get in the way. So yesterday, I dropped up to her studio off Grafton street to say hi and drop off the scarf. I’m very happy to report that it really suits her and hopefully will keep her snug right through to Spring! Unfortunately I suddenly became very unwell while I was there. Aoife stuck me into a taxi home and I’ve been in bed since. I’m ok but I’m really glad I was there when it happened and not on the street. 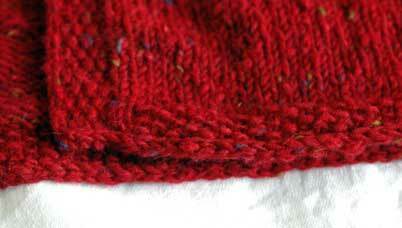 I have been dipping into my brother in law’s brioche hat too. This is very close to completion – and a good thing too because this needs to go in the post before the weekend. 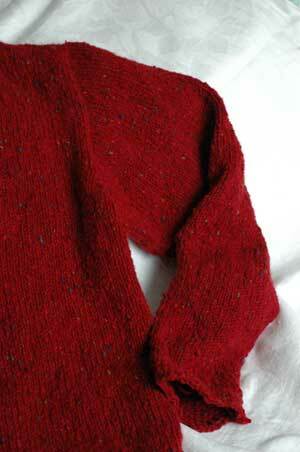 I finished the body of my mum’s cardigan a while ago but have yet to start the sleeves. The good news is that I got her to try it on Monday night and it fits perfectly. It is a great colour on her, I can’t wait until it’s finished and I can take some photos to show. Call me insane, but I am also really looking forward to the steeking! I put in a tiny bit of shaping to take the boxy feel out of it and it worked very well. In other news, I have been really taken with this. 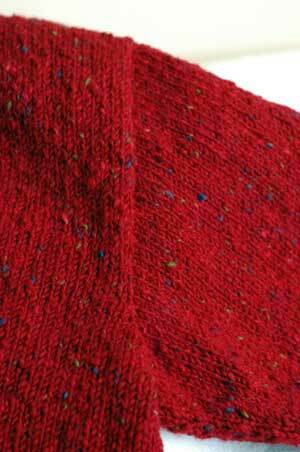 You really can’t go wrong with one skein projects for Kidsilk Haze! I was a little uncertain about the beads at first but now I like them. I probably won’t bother stringing them on to the yarn as I made sure to get ones with a big hole. I think I’ll try out the method where you use a crochet hook to pop them on whenever you need them. I have a 2mm hook and it’s just a little too big so when I recover and make it into town, I’ll pick up one those tiny 1mm hooks for filet crochet. That should do the trick!